ENELE SOSENE SOPOAGA, Prime Minister of Tuvalu, said that, more than ever, the world needs leadership that values multilateralism, trust and the moral responsibility to help those in need. Recalling that 2018 has been characterized by the fear of nuclear war “as if we have not learnt from the wrongs of the past”, he said the Pacific region is still coping with the effects of nuclear tests carried out decades ago. Through the Boe Declaration on Pacific Regional Security, Pacific leaders are calling for urgent action on human as well as military security, he said, adding that it was in that spirit that Tuvalu two days ago signed the Comprehensive Nuclear‑Test‑Ban Treaty. While commending the successful outcome of this week’s high‑level meetings on non‑communicable diseases and tuberculosis, he said rhetoric alone is not enough. Healthy lifestyles and diets must be promoted as a matter of urgency, supported by adequate financing and monitoring to ensure integrated progress. For its part, he said, Tuvalu has introduced Friday afternoon “sweat breaks” for all workers and has encouraged villagers to pursue more physical activities such as fishing and gardening. For small island developing States and least developed countries, achieving the Sustainable Development Goals depends on how the world tackles climate change, he said. Current global warming trends point to a very bleak and miserable future for low‑lying atolls like Tuvalu – a future that demands huge investments for mitigation and adaptation that are simply beyond their capabilities. “Climate change is a weapon of mass destruction. It is slaughtering fellow human beings worldwide,” he said. The United Nations must not allow the biggest greenhouse gas emitters to turn away from their moral duty to reduce their emissions and to save small island developing States like Tuvalu with adaptation support. 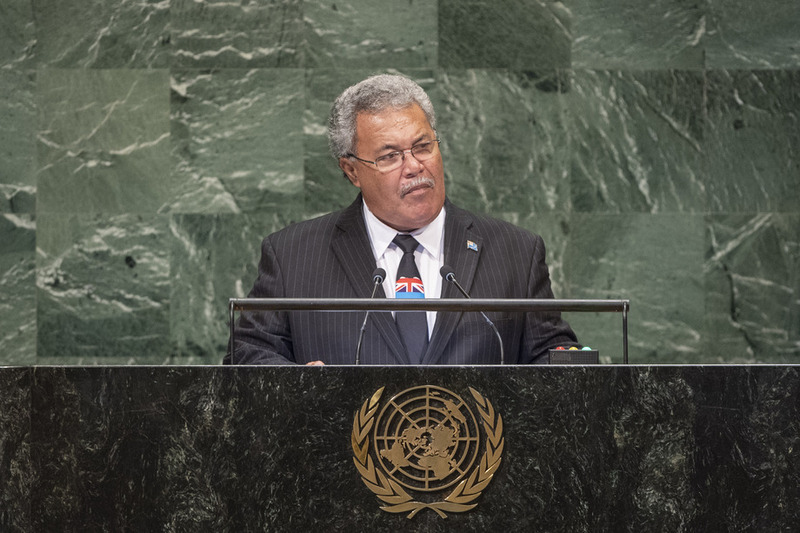 Every single year without action on climate change will draw Tuvalu a year closer to its demise, he said, appealing to the Assembly not to let that happen. Describing the upcoming Conference of the Parties to the 1992 United Nations Framework Convention on Climate Change as a critical milestone, he acknowledged efforts in the Security Council to add climate change to that body’s peace and security agenda. He reiterated Tuvalu’s call for the appointment of a Special Representative of the Secretary‑General for climate change and security, as well as a Special Rapporteur who would report on security threats caused by climate change. In addition, he repeated his country’s proposal for the United Nations to establish a legal process to protect the human rights of those displaced by climate change. He went on to call on the United Nations to provide strong leadership to drive genuine partnerships to address ocean‑related issues, including acidification, coral bleaching, solids waste and plastic pollution, and both inshore and offshore fisheries. The interests of small island developing States must be reflected in ongoing discussions on marine biological diversity in areas beyond national jurisdiction. On Taiwan, he said the United Nations must enable it to participate in its meetings, activities and mechanisms. He added that the unilateral economic embargo on Cuba neglects that country’s human rights and spirit of cooperation. Likewise, the United Nations must engage with the people of West Papua to find a lasting solution to their struggle, he said.